Gas continuous flow hot water heaters are a compact unit that do not require a bulky storage tank to store and heat your water. Mainly installed externally, there are some models that can be installed internally within cupboards or under sinks which are highly suitable for small units. 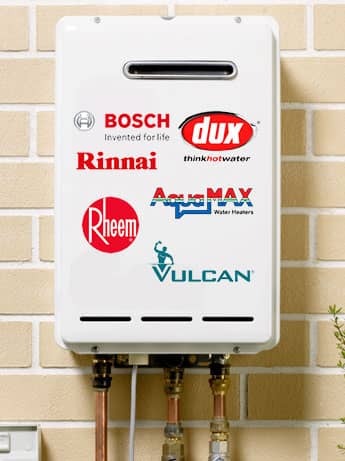 Tankless continuous flow hot water heaters are the most popular type of gas hot water systems. Not only do they provide endless hot water and are energy efficient, but tankless water heaters provide water only when it is needed. Without the use of a storage tank, you avoid standby heat loss — saving money in the end. Most tankless water heaters have a life expectancy of more than 10 years with easy-to-replace parts — making them a wise investment at purchase and in the long haul. We can undertake repairs on all makes and models of instantaneous hot water systems, but if your hot water system is beyond repair, Everlast Plumbing will always have a repair or replacement option that suits your requirements.